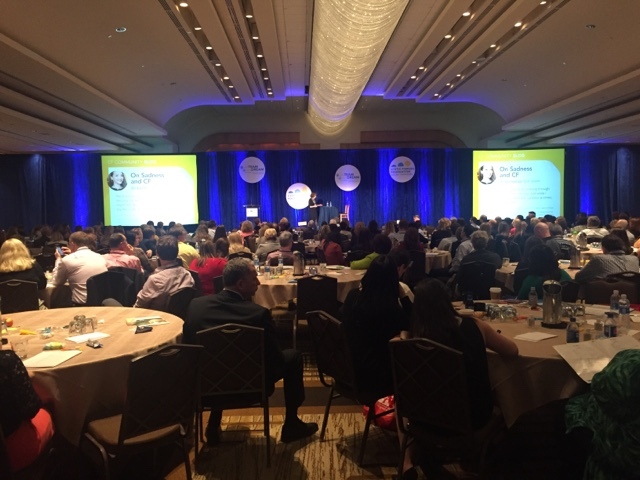 Two weeks ago, I had the privilege of attending the Cystic Fibrosis Foundation's Volunteer Leadership Conference (VLC) in Washington DC. I was one of more than 500+ parents, volunteers and CF staff who attended this conference that offered us an opportunity to network, share our experiences, gain new insights from other members of the CF community, learn more about what the Cystic Fibrosis Foundation (CFF) is doing and hear the latest on the CFF's effort to find a cure for CF. This blogpost (one of two) will summarize the parts the state of the science in our effort to find a cure for CF. For those who have 2 copies of the F508del gene mutation, Ivacaftor (Kalydeco) and Lumacaftor (Orkambi) is currently available on the market. But, as you can see from the slide above, it reaches only about 30% of the normal CI- transport. This is an improvement from the less than 10% most people with CF have. But, fortunately, there are three potential medications coming down the pipeline that might help. The first is VX-661 (whose trade name will be Tezacaftor). The second is VX-152. The third is VX-440. In the lab, it looks like the combination of Ivacaftor (Kalydeco) + VX-661 + VX-152 might offer the greatest benefit to people with CF. But, the Ivacaftor + VX-661 and VX-440 may also be a good option. For people like Bennett who have only one F508del mutation, Ivacaftor + VX-661 + VX-152 may still be the best option, however, the drug benefits will be lessened from potentially 80% normal CI- transport to possibly 50%. 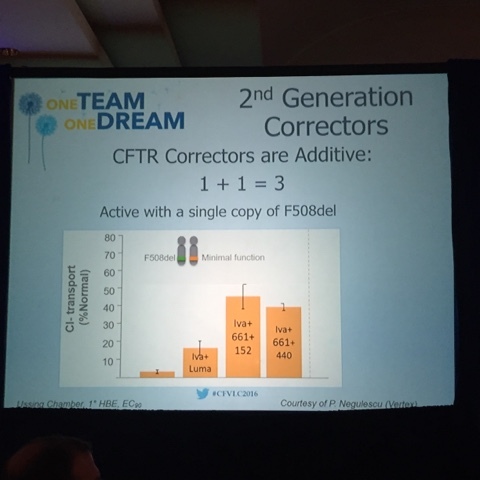 So when might these 2nd generation correctors be available to patients with CF? Dr. Boyle, from the CFF, said probably in 3-4 years ("maybe between 2020 and 2022"). 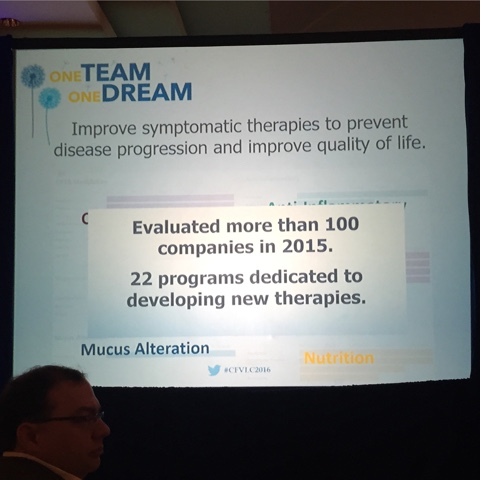 The CFF's goal is to find a cure for 100% of those with CF. Ninety-five percent of people are expected to benefit from Kalydeco and a corrector medication. There are a remaining 5% who will not benefit from Kayldeco + a corrector drug but there are efforts to help them as well, including the 3% who have nonsense mutations and the remaining 2% without nonsense mutations. 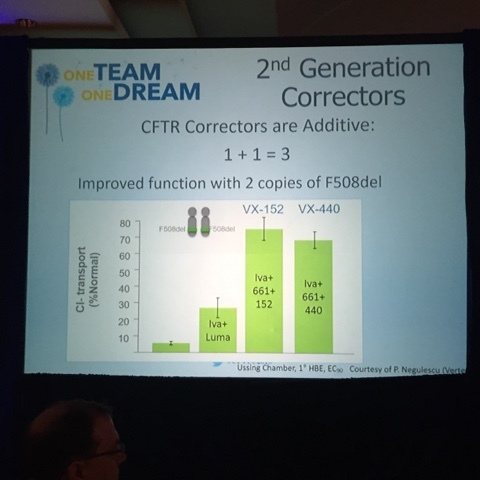 A new initiative has been started for those in that last 5% of CF mutations who will not benefit from corrector and potentiator drugs. 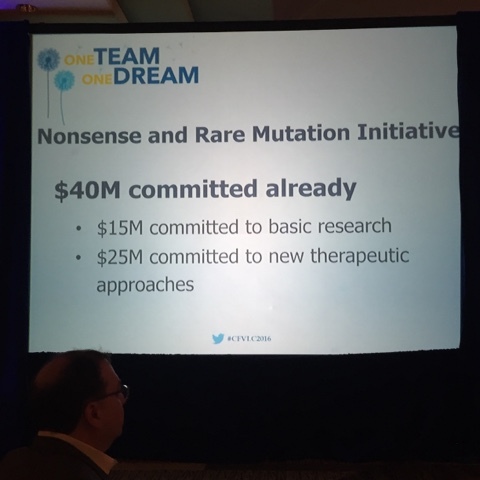 This initiative is called the "Nonsense and Rare Mutation Initiative" where 40 million dollars has already been committed to find a cure for these people as well. 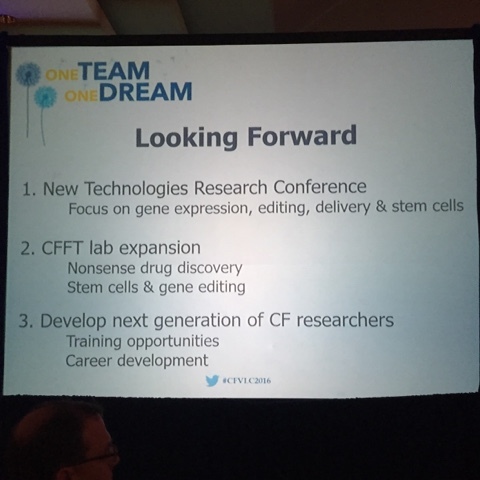 A few of the other projects that the CFF is working on include a "New Technologies Research Conference" where they are focusing on gene expression, editing, deliver and stem cells" (which, by the way, there will be a gene-editing plenary at the North American CF Conference this fall). 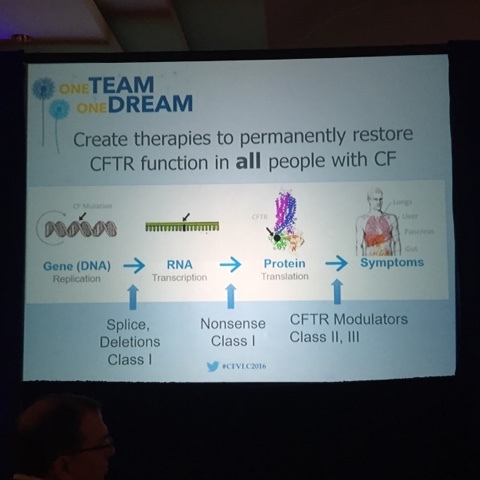 The CFF is expanding their CF Foundation Therapeutics Labs with a focus on nonsense drug discovery, stem cells and gene editing. And the CFF is working to develop the next generation of CF researchers will more training opportunities and career development. 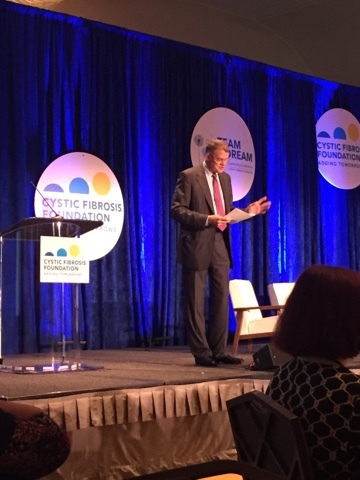 According to Dr. Bill Skach, the CFF is funding more grants, funding more labs and putting in more resources, towards a cure than ever before...all while also putting more resources towards expanding the programs to help those with CF live a healthier and happier life. 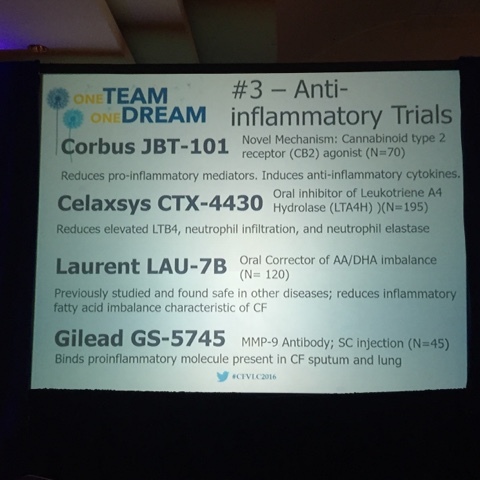 Dr. Boyle gave an overview on the top 5 Emerging Topics in CF Clinical Research. 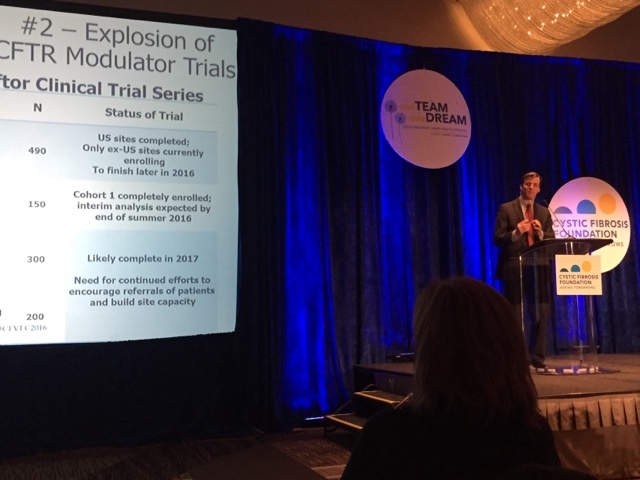 They include: a worldwide effort to enroll clinical trials, an explosion of CFTR modulator trials, new anti-inflammatory clinical trials, continued work with the FDA and a new focus on lung transplantation. 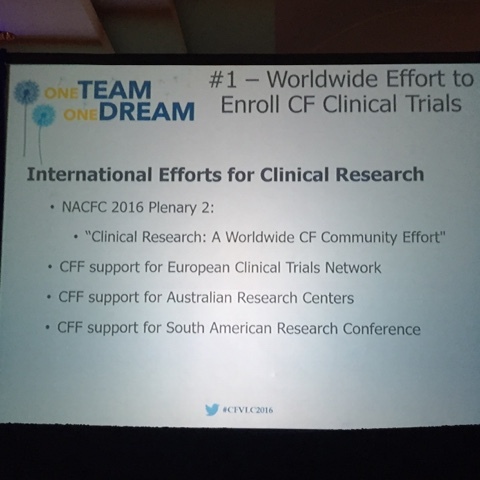 The CFF is working to improve enrollment for CF Clinical Trials by supporting and working with other CF Clinical Networks. This is good for everyone in our 70,000-person worldwide community. 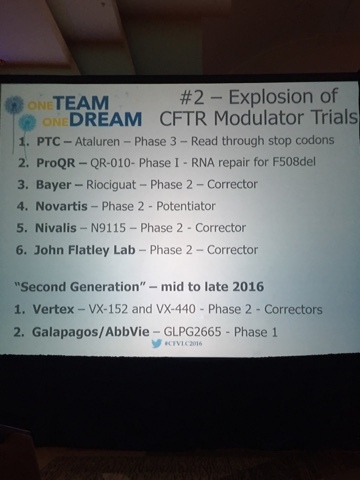 There has been an explosion of CFTR modulator trials. This means that there may very soon be competition for Vertex. 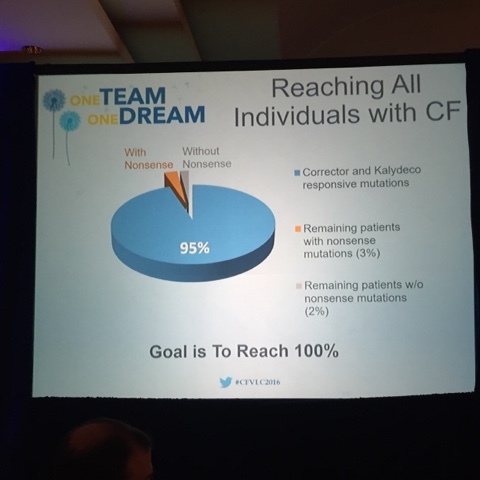 This is such amazing news as more and more labs are knocking on the CFF's door to get a piece of the Finding-A-Cure-For-CF pie. VX-661 is already involved in clinical trials. The VX661-108 trial, evaluating those with 1 F508del mutation and one residual function mutation (typically those who are pancreatic sufficient) is likely to complete in 2017. 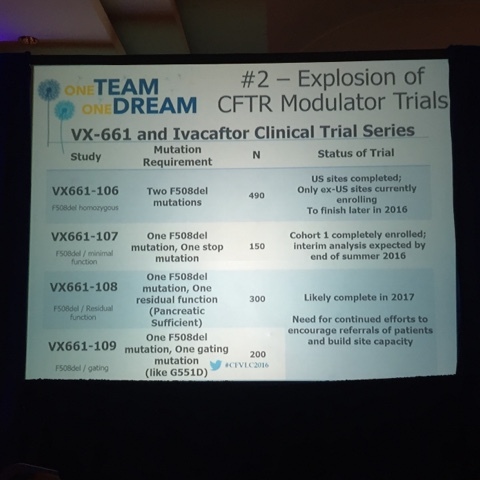 The VX661-106 trial, those with 2 F508del mutations, may finish later this year. The VX661-109 clinical trial is still working to build it's site capacity. Inflammation is part of the devastating cycle of CF and it's damage on the lungs. So, it's really great to see there are some potential anti-inflammatory medications in clinical trials. 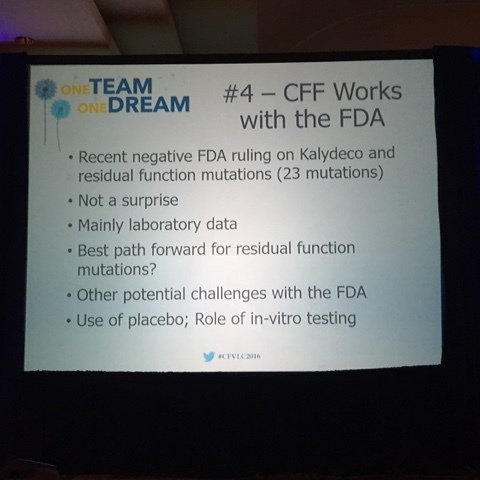 The fourth topic of Emerging Topics in CF Clinical Research is that the CFF is working with the FDA. 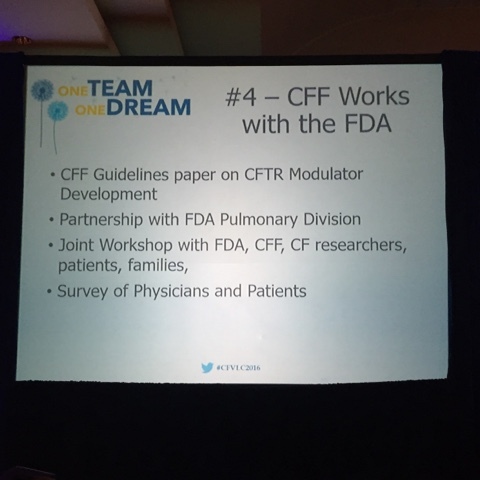 The CFF has put out a guidelines paper on CFTR modulator development, has a partnership with the FDA Pulmonary Division, holds a join workshop with the FDA, CF researchers, parents and families and surveys physicians and patients. The CFF recognized there was a recent negative FDA ruling on Kalydeco and residual function mutations. It was not a surprise as it was based on mainly lab data. They are evaluating the best path forward for residual function mutations, negotiating other potential challenges with FDA and is look at the use of placebo/role of in-vitro testing in FDA approvals. 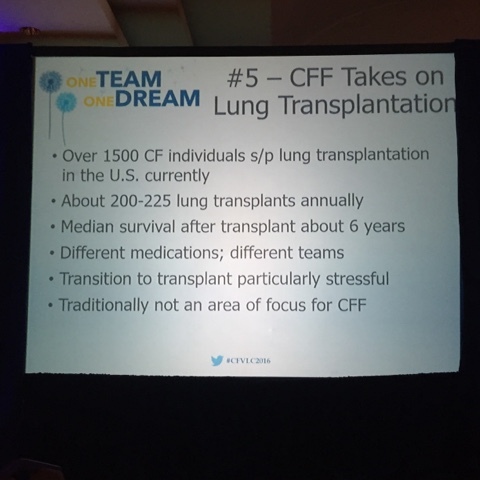 The last Emerging Topic in CF Clinical Research presented by Dr. Boyle was that the CFF is taking on lung transplantation. 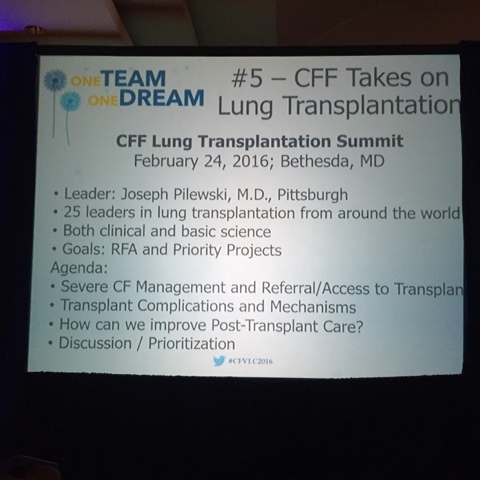 Lung transplantation is the last resort for many with CF at end-stage disease. The CFF wants to increase support during that period of time. 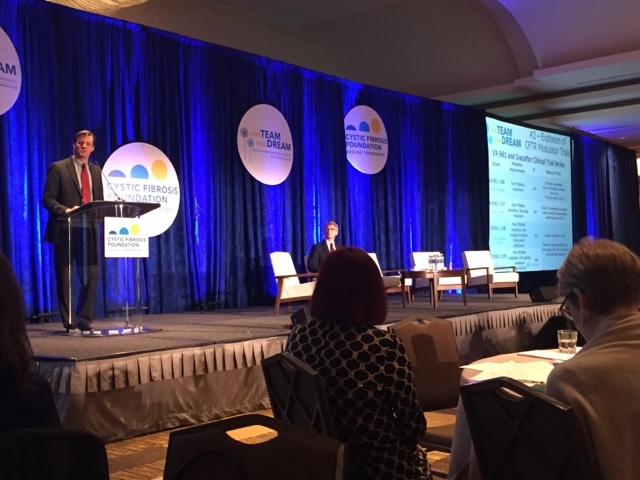 The CFF recently held a CF Lung Transplantation Summit that began evaluating how to improve pre-transplant, transplant and post-transplant care. Dr. Boyle said, "we know lungs are rejected faster than kidneys and hearts. We need to find out why." 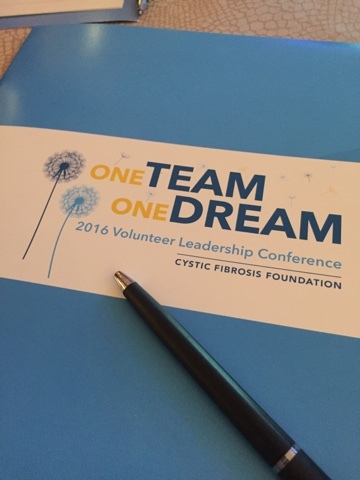 In the next VLC blog post, I'll share more about the good things the CF Foundation is doing to improve care for people with CF!